VIM is a very powerful command line text editor that is loved by experts and often hated by novices, mostly because it has a fairly steep learning curve that may seem unintuitive to those who aren’t familiar with it. 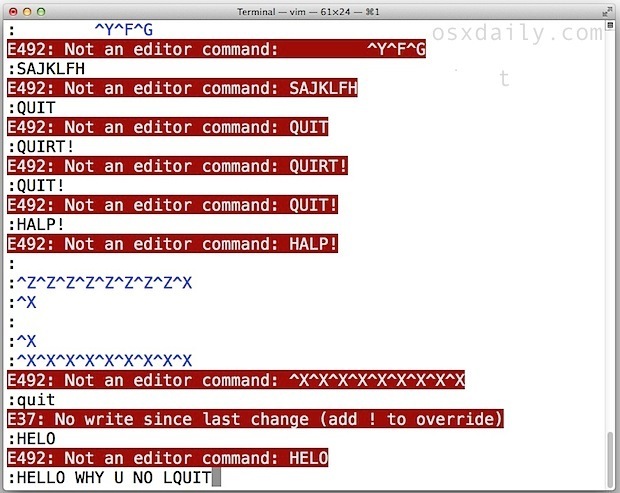 Even something as simple as quitting out of VIM can seem like a challenge to those who aren’t familiar with VI, and often results in mashing Control+C Control+X !q !q enter escape Control+Z until eventually something happens and maybe the process suspends or maybe quits who knows for sure, so just follow that up with a “killall vim” and on you go, back to open the same text file again in nano, right? OK, that’s not ideal, but we’ve all been there. That’s what we’re looking to avoid from now on, because even if you don’t want to use vi you can at least know how to exit it properly. This tutorial will show you exactly how to quit VIM / VI properly, actually it will show you multiple different ways to exit VI! This will instantly quit out of VIM without saving, basically the same as the :q! command. These are the two fastest ways to exit out of VIM for me personally, but everyone has their own opinions here and many prefer to type a command in the more traditional manner. To be perfectly clear, hitting the “Escape” key enters into command mode. Then typing :q is literal, as in a colon not a semi-colon, so it would be Shift+; followed by q and hitting the Return key enters the command to quit. So that’s how to escape VIM, any less confused? Perhaps not, and that’s OK, we’ll generally stick to using nano around here for walkthroughs because it’s more user friendly. And there’s nothing wrong with that, even though I’ve grown more comfortable with VIM over time, I still prefer nano out of ease and perhaps old stubborn habits. For those interested in learning VIM or at least becoming more comfortable with it, you can always try the vimtutor command, use this excellent online interactive VIM tutorial, and just get more practice by using it often on any terminal. 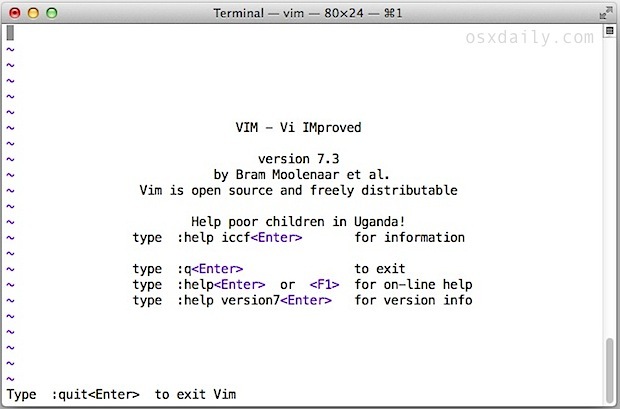 You can even get vim on your iPad or iPhone if you’re really committed. And at least you know how to quit out of vi now, right? I do appreciate the article and it may help some newbs. Or yea, stick with nano or emacs. Easy. Not really… I use :x to save and quit. Rarely, as in Sasquatch-rarely, need anything else. Typo: you specifically say “colon” not “semi-colon” in the first half of this sentence, “Then typing :q is literal, as in a colon not a semi-colon…” but in the latter half you have, “…so it would be Shift+; followed by q…”, and show a semi-colon. 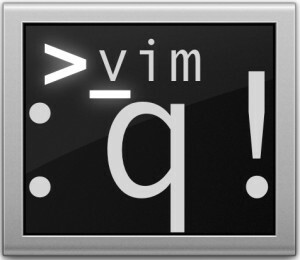 My 5 cents: if you have multiple split windows in Vim, you need to do “:qall” or “:qall!” to quit all windows (or repeat “:q” multiple times).